Culinary art lovers and foodies have an ultimate cooking solution for your kitchen. 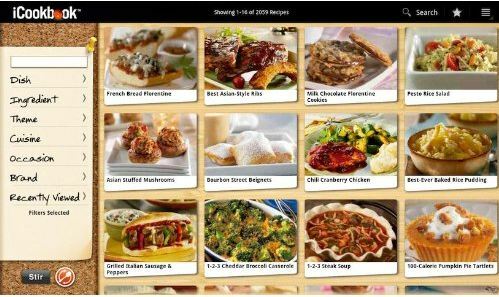 More than 2,000 recipes and photographic illustrations are incorporated in this cooking app which is equivalent to 20 giant cookbooks. The iCookbook app for Android team of food experts and Accredited Nutritionist select recipes that use readily accessible and affordable ingredients. Each recipe will inspire you and help you to solve your everyday problem of meal selection. Another exciting offer is that you get FREE recipes every month! No additional cost for new recipes that the iCookbook team includes and it can be added in your collection. Working wonders in your kitchen is simple now with this inspiration iCookbook Android app. You can download iCookbook app for Android for just $0.99 from Google Play Store. The intuitive visual interface of iCookbook helps the Cooks to view photos, graphics for an easy recipe illustration. Prepare Mode is unique to iCookbook. It provides an enhanced display of a recipe which a cook can read at a distance from their tablet or phone. Stir it Up! Feeling adventurous? Press Stir and iCookbook gives you a selection of randomly chosen recipes based on a particular search or filter. My Recipe Box helps a cook to create a set of iCookbook favorite recipes for easy retrieval. You also get a chance to add your personal recipe to the collection. Yet another facet of iCookbook is you can personalize the Recipes. Putting a personal touch to the recipe is of common interest and hence our Notes, feature allows you to record your ideas and comments about iCookbook recipes. Further, all these can be shared with friends and family via Facebook or e-mail. This will let your friends know what special you are cooking. Missing on with your favorite Grandma’s Chocolate cookies or your world famous pasta sauce? When you are with iCookbook it won’t happen as all your recipes can be easily add shared with your own photo illustrations. Kitchen Tools, Multiple Timers, Substitution List and Measurement Conversion charts are handy within iCookbook app. The Shopping List is developed in such a way that you can tag ingredients directly from a recipe to your shopping list and then e-mail your list. iCookbook app for Android is a complete solution for all your cooking needs in the kitchen. Be it a party you have called for or a family re-union or your Childs Birth bash iCookbook is always handy with special dishes every now and then.